Often called a silent disease, many people with osteoporosis will have no idea that they have the disease, as there are no obvious symptoms. In fact, sometimes the first sign that an individual has osteoporosis is when the first bone is broken. Along with fractures, which are the most serious signs of this disease, osteoporosis can cause the upper back to become excessively hunched (itself often a result of spinal wedge fractures). There maybe widespread pain as bony tissue is increasingly unable to withstand normal forces. As this is primarily a metabolic disorder, there are a variety of things that can cause osteoporosis. These factors either interfere with the body’s ability to either produce bone tissue, or encourage excessive breakdown. This can be anything from gastrointestinal conditions that prevent absorption of calcium, lack of dietary calcium or low levels vitamin D, which is essential for absorption of calcium. 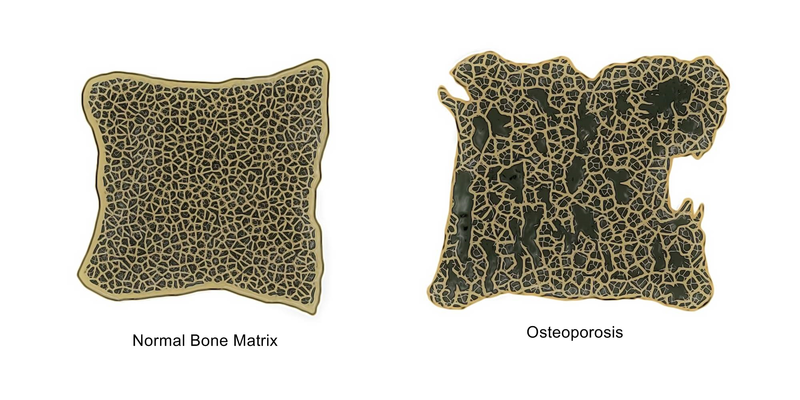 As bones respond to force and weight bearing by building more bone, having a sedentary lifestyle or doing activities with low impact can also lead to osteoporosis. This has been shown to be an issue amongst professional swimmers and cyclists.